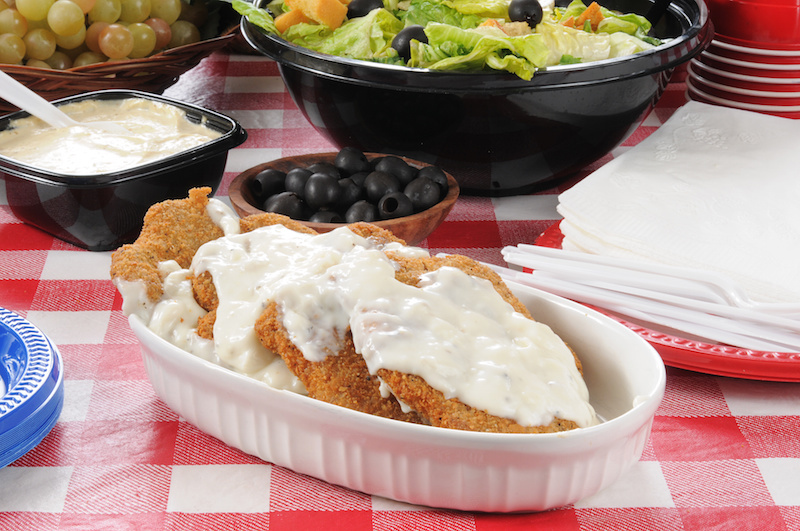 Ready to enjoy our great tasting country fried steak recipe with gravy? Believe me, country fried steak with gravy will surely stick to your stomach. We'd like to share our recipe for Country Fried Steak with you, so that you can cook yourself a homemade, home-cooked meal that you will be proud of. It's been some time since I tried cooking country fried steak with the recipe you see below, however, I can recall the last time I prepared this recipe we eat very well. Funny story... my stomach was growling the whole time I was preparing this recipe, I couldn't wait to sink my teeth into the meal. But right as I finished cooking I was called away back to my job. That didn't stop me from eating. I made me a quick sandwich and ate on the way back to work. Rinse round steak under running water and pat dry with paper towels or kitchen towel. Cut the steak crosswise into 4 serving pieces. Pound each piece of steak to about 1/4 inch thickness. In a small bowl, combine and mix eggs and milk. Egg mixture is formed. In another small bowl, combine and mix together flour, salt and black pepper. Flour mixture is formed. Dip one piece of steak first into the egg mixture and then into the flour mixture, coating completely. Gently shake away excess flour. Repeat step for remaining pieces of round steak. In a medium skillet, melt the butter over medium heat. Fry steaks, being sure not to overcrowd the skillet. Cooks two steaks at a time and you'll be okay. Cook steaks for about 5 minutes on each side, until they're golden brown. Add more butter and repeat process for two remaining steaks. Time to prepare for making the gravy. Combine and mix together milk and water. Set milk mixture aside. To prepare gravy, pour off all but about 4 tablespoons of the drippings from the skillet. For the best gravy be sure to scrap away dried pieces of flour and meat from the bottom and sides of the skillet. Heating skillet over medium heat, slowly cooking and stirring in the 1/4 cup of flour. Next slowly add milk mixture to skillet and continue to cook and stir. Next add salt and black pepper to taste. Bring the gravy to a boil, reduce heat to low and continue to cook and stir until gravy has reached desired thickness. Serve your country fried steak recipe with gravy, biscuits and mashed potatoes.